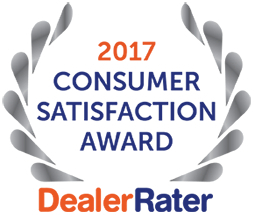 Sun Toyota wins DealerRater's "2017 Consumer Satisfaction Award"
HOLIDAY, Fla. - Feb. 6, 2017 - PRLog -- Sun Toyota has won DealerRater's prestigious "2017 Consumer Satisfaction Award," an annual recognition given to auto dealerships in the United States and Canada that deliver outstanding customer service as rated by online consumer reviews. "It's an honor to earn this award," said John Marazzi, Morgan Auto Group's managing partner at Sun Toyota.."Putting our customers first has long been a basic tenet of how we do business every day. We have the best customers anywhere—and we're very appreciative of their generous, positive online reviews of their buying and service experiences with us." Sun Toyota strives to improve every aspect of their customers' satisfaction throughout the year with its sales and service operations. Employees are empowered to seek improvements to ensure extraordinary customer service in every department. Founded in 2002, DealerRater (http://www.dealerrater.com/), a Cars.com (http://www.cars.com/) Company, is the world's leading car dealer review website that connects consumers with the right person at the right dealership. www.DealerRater.com offers more than 2.5 million sales and service reviews across 41,000 U.S. and Canadian dealerships. Auto dealers are rated on customer service, quality of work, friendliness, price and the overall customer experience. Dealerships can't buy or influence ratings—except to operate with the highest integrity and go above and beyond to consistently provide the best products and services. Sun Toyota is a division of Morgan Auto Group and is located at 3001 US Highway 19 between Moog Road and Sunray Drive in Holiday, FL 34691, on the border of New Port Richey. For more information, call (727) 310-3070 or visit http://www.suntoyota.com/.